Wooster, Ohio, located approximately 60 miles South of Cleveland, is constantly rated as one of the most desirable places in the state to live. For forty years the community was served by a local racquet club with four courts. When that facility closed, the Wooster tennis community needed a new facility. The Aspen Racquet Club broke ground in August 2017 and opened its doors in January 2018. 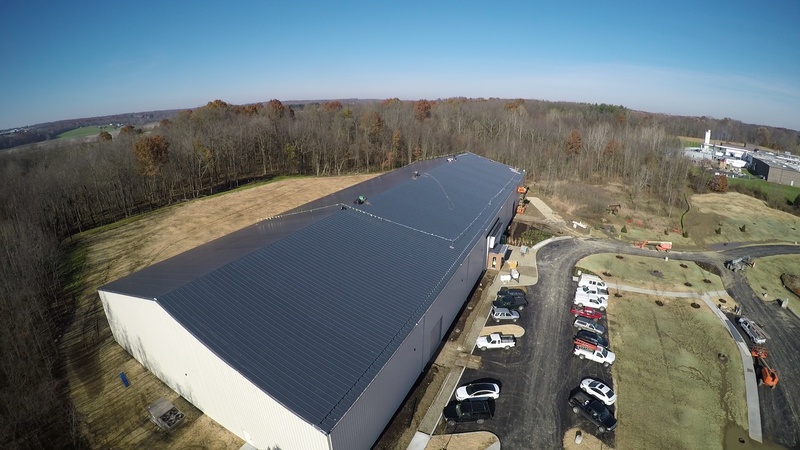 Situated on six acres in the City of Wooster, this state-of-the-art facility boasts six-courts, a workout room, well-appointed locker rooms and pro shop. The ReboundAce playing surfaces have foam layers between the asphalt base and the painted top coat for less stress on knees and hips during play. The owner, Richard Seaman, Chairman of the Board at Seaman Corporation and avid tennis player, used several products manufactured by Seaman Corporation throughout the facility. The roof is one of the first things that will catch your eye as you pull up to the 48,000 square-foot club. The patented FiberTite® Simulated Metal Roofing System comprised of FiberTite’s proprietary KEE roofing membrane was installed over the roof deck to provide a highly aesthetic finish to the building. The profiles, installed directly on the membrane, simulate an architectural roofing system and offer the look of metal with the protection of FiberTite. The standard metal building utilizes solar energy panels on the backside of the roof to power the facility. Located in Northeast Ohio, this roof will be exposed to extreme cold and hot temperatures, as well as wind and hail. FiberTite has performed well in these conditions and protected some of the world’s most powerful brands, with roofs often lasting 30+ years. Seaman Corporation has been a worldwide market leader of innovative, high performance coated fabrics since 1949. Using a unique, four layer technology providing puncture, UV, chemical, and ponding water resistance, FiberTite® is the original Elvaloy KEE membrane with a 35+ year history of performance. Seaman Corporation has manufacturing locations in Wooster, Ohio and Bristol, Tennessee. In addition to FiberTite, Seaman Corporation also manufacturers fabrics for more specialized markets, including military, dock seals, marine applications, pool covers, truck tarps, mower covers, precast concrete and others. Being involved in the tennis community for many years, Seaman Corporation has provided fabric for tennis curtains and outdoor windscreen. The company has been the major supplier of the fabrics used for air supported structures, commonly called “bubbles,” that are utilized for indoor tennis facilities.